If you have finished primary treatment for early-stage, estrogen receptor-positive breast cancer, your doctor will likely recommend hormonal therapy for a period of 5 to 10 years. The choice of drugs will depend on your menopausal status, with aromatase inhibitors usually the first choice for post-menopausal women as well as some premenopausal women along with ovarian suppression therapy. What is the difference between Femara, Arimidex, and Aromasin, what are the side effects might you expect, and how do these medications differ from tamoxifen? How effective are they in preventing the recurrence of breast cancer? Aromatase inhibitors are medications that block the production of estrogen in the body. In doing so, they reduce the risk of breast cancer recurrence (and increase survival) for women who have early-stage estrogen-receptor positive breast cancer and are postmenopausal. They may also reduce the risk of recurrence for some women with premenopausal breast cancer more than tamoxifen. There are three different medications in this class of drugs. Aromatase inhibitor treatment is begun after the primary treatment of a breast cancer is complete. This includes breast cancer surgery and possibly chemotherapy and/or radiation therapy. Treatment is continued for 5 to 10 years depending on an individual's risk of recurrence and tolerance of side effects. Breast cancers that are estrogen receptor positive are essentially fed by estrogen. Breast cancer cells, like normal breast cells, have estrogen receptors on the surface. 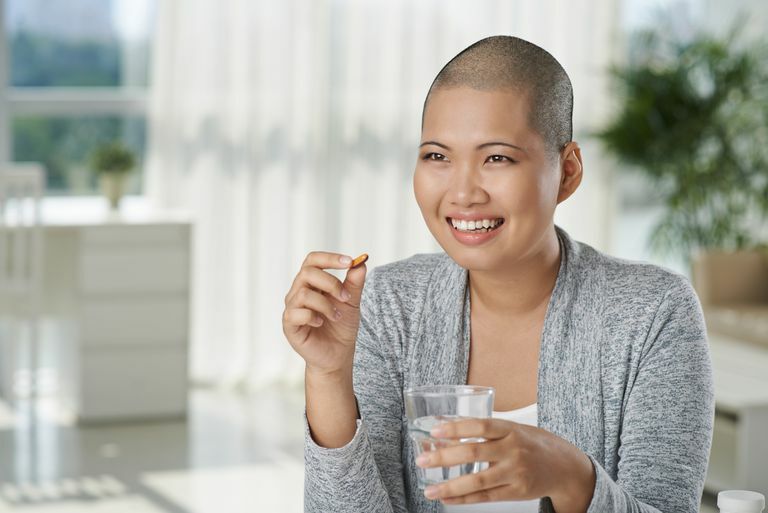 Cancers that are considered "positive" for estrogen or progesterone receptors are those in which these estrogen receptors are primarily responsible for the growth of the cancer. The role of estrogen in these tumors is to bind to estrogen receptors to stimulate the growth and division of the cells. In order to slow or stop the growth of breast cancer cells, we thus need a way to either reduce estrogen in the body or block the estrogen receptors so that estrogen that is present can't bind. Before menopause, the ovaries are the main site of estrogen production in the body. The drug tamoxifen works by blocking estrogen receptors on breast cancer cells (and other cells) so that estrogen cannot bind. Tamoxifen actually has anti-estrogen effects on some parts of the body such as the breast, but pro-estrogen effects on others, such as the bones (it can reduce bone loss). First approved in 1998, tamoxifen has been the mainstay of hormonal therapy for breast cancer for over two decades. After menopause, the primary source of estrogen is from the peripheral conversion of androgens (male type hormones found in fat cells) into estrogen. This reaction is facilitated by an enzyme known as aromatase. Aromatase inhibitors work by blocking aromatase so that androgens cannot be converted to estrogen in the body. Since the primary source of estrogen before menopause is the ovaries, not the peripheral conversion of androgens, aromatase inhibitors alone would be ineffective in women who remain premenopausal (and a woman may still be menopausal even if her periods go away from chemotherapy). These medications appear to be roughly as effective in preventing recurrence but do have some differences. Aromasin is a steroid, whereas Arimidex and Femara are not. The toxicity of these three medications also appears to be similar. We have a vast amount of information at this time looking at the use of tamoxifen and the risk of breast cancer recurrence. Overall, when used for early-stage, estrogen receptor-positive tumors, the drug reduces the risk of recurrence by roughly 50 percent. Tamoxifen also lowers the odds that you will develop another tumor in your breast (if you had a lumpectomy) or that you will develop a second breast cancer in your other breast. Aromatase inhibitors appear to reduce the risk of recurrence even more than tamoxifen and are now considered the drugs of choice for postmenopausal women or those who are premenopausal and have undergone ovarian suppression therapy. For postmenopausal women taking an aromatase inhibitor, 2017 guidelines now recommend using the bisphosphonate Zometa (zoledronic acid) along with the aromatase inhibitor. The combination of the two drugs together appears to reduce the risk of breast cancer spreading to the bones more than that of the aromatase inhibitor alone. Learn more about the use of bisphosphonates for early-stage breast cancer. The question of whether adding ovarian suppression therapy (using gonadotropins to medically cause menopause) to tamoxifen has been a matter of some debate. A study published in the New England Journal of Medicine in 2015, however, seems to indicate that premenopausal women who are treated with ovarian suppression therapy so that they may use an aromatase inhibitor instead of tamoxifen may have better survival rates. Another study published in the same journal in 2014 found that Aromasin (exemestane) combined with ovarian suppression therapy significantly improved survival compared with tamoxifen plus ovarian suppression therapy. Since aromatase inhibitors have significantly more musculoskeletal side effects and can lead to bone loss, many oncologists recommend reserving this approach for premenopausal women who have Stage 2 and Stage 3 breast cancers, which are more likely to recur. As with any medication, side effects and adverse reactions may occur for some women on aromatase inhibitors. Some of the more common side effects are those related to the reduction of estrogen in the body (menopausal symptoms) and include hot flashes, night sweats, vaginal dryness, and vaginal discharge. While these symptoms can be annoying, studies suggest that hot flashes are a good sign in women with breast cancer, and those who experience these side effects have better outcomes. Joint and muscle pain is also a very common side effect of aromatase inhibitors. It is these body aches that are one of the greatest reasons for women discontinuing these drugs. One of the more serious concerns on aromatase inhibitors is bone loss, with the use of these drugs potentially leading to osteoporosis and fractures. Many oncologists recommend testing bone density prior to beginning these medications as a baseline, and follow-up depending on the results of this initial test. The addition of bisphosphonates (Zometa) to aromatase inhibitor therapy may significantly reduce this risk. Bisphosphonates were first approved as treatments for osteoporosis, and Zometa has been found to reduce the risk of both spine and hip fractures (and the disability which often goes with these fractures). Zometa was then recommended for people with metastatic cancer, as it could reduce bone pain and the risk of fractures related to bone metastases. Further studies suggest that Zometa alters the microenvironment of the bones so that breast cancer cells can't "stick" as easily. In clinical use, it appears to reduce the chance that a person's breast cancer will spread to their bones. Aromatase inhibitors are also associated with an increased risk of heart problems. While this is true, it's been found that serious and life-threatening cardiovascular diseases such as heart attacks and strokes are not any more common in women who take aromatase inhibitors than in those who do not take these drugs. Heart conditions that occur more commonly on these medications include heart rhythm disorders, heart valve problems, and pericarditis (inflammation of the membranes surrounding the heart). A 2018 study also noted that diabetes is more common in women with breast cancer who have been treated with hormonal therapy. Overall, the risk was 2.40 times that of the average population. The risk, however, was more common in women using aromatase inhibitors (4.27 times normal) compared with tamoxifen. The side effects of aromatase inhibitors, especially the body aches, can be challenging at times. Unfortunately, these side effects result in too many women discontinuing their treatment prematurely and losing out on the recurrence prevention (and improved survival) they offer. If you are suffering side effects, talk to your oncologist. Even though the safety and toxicity of the three drugs in this class are similar, roughly a third of women are able to tolerate a different medication in this class. Some people who are premenopausal and treated with tamoxifen may become postmenopausal during treatment. This is especially true for women who develop breast cancer around the time of menopause. Since chemotherapy often results in amenorrhea (absence of periods), blood tests may need to be done to determine whether you are truly in menopause. Studies have found that switching to an aromatase inhibitor following 2 to 3 years of tamoxifen therapy results in better survival than continuing on tamoxifen. While it was recommended that people continue tamoxifen or an aromatase inhibitor for 5 years in the past, newer data suggest that taking these medications for 10 years further reduces the risk of recurrence. It's fairly well known that breast cancer may recur many years or even decades after the primary tumor is treated, and this risk is particularly high in women who have had estrogen receptor-positive tumors. We don't know why some breast cancer come back after years or decades, but we know this happens too often. Both tamoxifen and aromatase inhibitors appear to continue working after they are discontinued, though some researchers believe that continuing hormone therapy may be extended to even longer than 10 years in the future. That said, the possible benefits need to be weighed against the risks. Unlike tamoxifen which has been around a few decades and has generic forms, the aromatase inhibitors can be expensive. Insurance plans often cover part of the cost, though they may only offer coverage for one of the medications in this class. If you are having difficulty affording your AI, check out these tips on managing the cost of hormonal therapy. Aromatase inhibitors work by preventing the production of estrogen in fat cells, the primary source of estrogen in postmenopausal women. We've known for a few decades that tamoxifen can significantly reduce the risk of breast cancer recurrence and these numbers appear to be even better with the aromatase inhibitors. Unfortunately, and as with any medication, side effects are common, and the body aches may be the most annoying. If you are experiencing these, work with your oncologist. Sometimes it's helpful to switch to a different drug in this class. Integrative treatments ranging from massage to meditation may also be helpful. It's also important to remind yourself why you are taking the drug. Side effects can be annoying but are preferable to having a recurrence. Now that bisphosphonates are recommended along with aromatase inhibitors, the concern of reduction of bone density and osteoporosis may be less of a problem then in the past. Keep in mind that every woman is different and there is not a "magic" duration of time for which everyone should take these drugs. For each person, it's important to weigh the potential benefits against the experienced side effects and potential risks. Make sure to ask a lot of questions and be your own advocate in your care. Nobody is more motivated that you are to live your life free from cancer. Francis, P., Regan, M., Fleming, G. et al. Adjuvant Ovarian Suppression in Premenopausal Breast Cancer. The New England Journal of Medicine. 2015. 372(5):436-446. Hague, R., Shi, J., Schottinger, J. et al. Cardiovascular Disease After Aromatase Inhibitor Use. JAMA Oncology. 2016. 2(12):1590. Pagani, O., Regan, M., Walley, B. et al. Adjuvant Exemestane with Ovarian Suppression in Premenopausal Breast Cancer. The New England Journal of Medicine. 2014. 371(2):107-118. Hamood, R., Hamood, H., Merhasi, I., and L. Keinan-Boker. Diabetes After Hormone Therapy in Breast Cancer Survivors: A Case-Cohort Study. Journal of Clinical Oncology. 2018. 36(20):2061-2069.